PROVEN IN PRACTICE - CONTINUOUS PRODUCT CONTROLS FOR THE BEST QUALITY! The right choice of the optimal substrate particularly depends on the requirements of the plants and the cultivation conditions. The exact knowledge of origin, natural location, climate, light, nutrient, air and water requirements, vegetative and generative growth phases are an important prerequisite for selecting the correct substrate. With our fact check we support you in the decision-making. The quality and performance of growing media are predetermined with the right raw material components. The harvesting method, harvesting technique, structure, moisture content and processing determine important physical factors such as air and water capacity or structural stability. In addition to the biological and physical values that we determine by selecting the right raw materials, the mixture of nutrients, lime, wetting agents and other additives, such as clay granules, leonardite or perlite, combined in one formulation, is decisive for an optimum success of the plants. All components are incorporated in a homogeneous mixture in precise dosage. *organic fertilizer according to European Council Regulation No. 834/2007. If your unique climatic conditions or your specific plant culture requires a certain formulation, we are happy to advise you. terracult substrates are available in a wide assortment - from reasonably priced standard substrates to individual, customer-specified special mixtures including substrates used for growing primroses, violas, poinsettias as well as container or perennial substrates with Osmocote Exact slow release fertilizer. 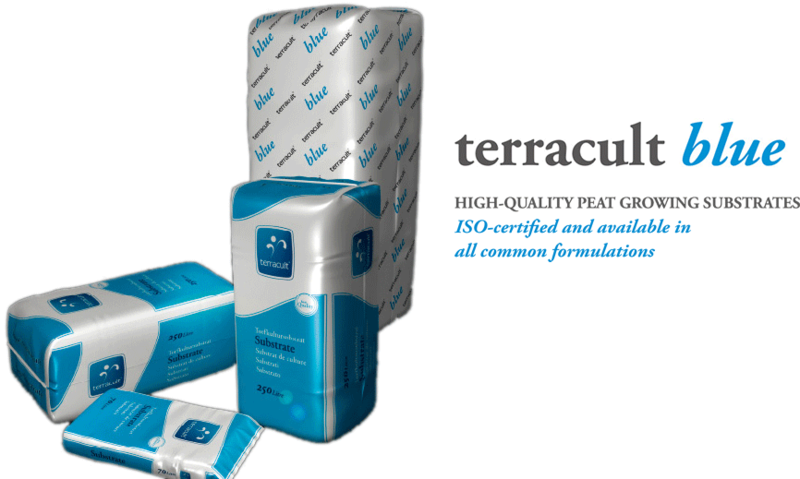 terracult substrates are delivered in 70 L bags or 250 L bales. Bulk purchasers may request big bales ranging from 5.0 m³ to 7.0 m³ on single-use, EPAL or ISPM-15 pallets. * The loading amount depends on the size of the truck or container and on the permissible maximum weight in the individual countries. The peat quality ex factory, the degree of decomposition as well as the weight also have an influence on the loading amount.